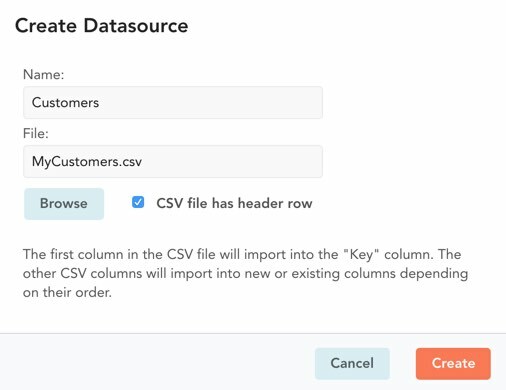 To create a new DataSource, you must first prepare a CSV file containing your data. We use the CSV format because it is simple and most applications can export data in this format. The one requirement for the CSV is that the key column must be the first column in the CSV. See here for more on DataSources and key columns. Export the desired information from wherever it resides. In this example, you will likely have the customer information in one of your existing business systems, like Quickbooks. Open the exported file in a spreadsheet program like Excel, and make your key column the first column. In this example, that would be the customer name. Save your spreadsheet in the CSV format. It is good practice to include your column names in the CSV header. Most applications will have the option to do this. 1. Expand the More dropdown in the web app header, and select Manage DataSources. 2. Click the Create button. The Create Datasource dialog appears. 3. In the Name field, enter the name for your new DataSource. 4. Click Browse to launch the file chooser, then select your CSV file; the File field will fill in with the selected file's name. 5. If your CSV file has a header row, check the CSV file has header row box. 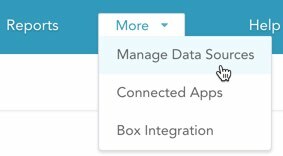 If this box is checked, the header row will be used as the DataSource column names. If it is not checked, generic column names will be used ("Column 1", "Column 2", etc.). The data from the CSV file will be uploaded into GoFormz, and your new DataSource will appear in the DataSources list. See here for details on editing your new DataSource.